New Delhi: Maqsood Ali Khan, who runs three Delhi Public Schools in Bangalore, was one of the people who attended Major Sandeep Unnikrishnan’s funeral last week. “To honour the martyr," said Khan. Khan called a meeting of his staff the next day. From Monday this week, his schools have been equipped with metal detectors, the boundary walls are being raised and the schools will soon deploy ex-army soldiers for its security. In Mumbai, the venerable Cathedral and John Connon School, whose alumni include J.R.D. Tata, issued a circular to all parents on Thursday, assuring them that security will be tightened. “No hi-fi measures. This is a school and we want it to remain a school," said Abha Sahgal, principal of the up-market Sanskriti School in south Delhi, which has conducted security drills after the Delhi blasts. It will now conduct a drill, including evacuation, every month. A few schools echoed Sahgal’s views. “Over zealousness will not solve the problem," said Harold Carver, principal of St. Stephen’s School in Chandigarh, which has 2,400 students. “If a well-trained terrorist intends to break in, there is very little that any of us can do." His school has placed extra guards at the gates, drawn up emergency plans and prepared for a quick mobilization of staff on duty at the slightest hint of trouble. Some schools plan to scale-up security to a constant tracking of students. The Delhi Public School (DPS) in Sector 45 of Gurgaon, a suburb of Delhi, is relying on sophisticated technology to track children—while making parents pay for it. DPS will instal a system combining satellite-based and mobile phone technologies to equip each of its 5,000 students in its Sector 45 school with a chip that can monitor their movements. Ghazi Aasim, head of marketing for RJ Corp., or the Ravi Jaipuria group which runs DPS Gurgaon, and a parent himself, said the security precautions are appropriate. “Yesterday (Wednesday), I went for nursery admission for my child in a school in Noida and did three recces to see from where the bus will go. That’s when I felt whatever we are doing in our school is the right thing", said Aasim. The school plans to charge parents a one-time security deposit of Rs2,700 and a monthly charge of Rs250 for the system. While some parents have protested online (including in an email forwarded to Mint), other parents said they are willing to pay-up. “It (the system) is important for the security of kids. It is our responsibility also", said Sunaina Arora, a doctor who has two daughters at DPS Gurgaon. But some schools say they will provide extra security without passing the cost on to the parents. “The security does not cost much," said Khan of DPS in Bangalore. Parents of Sanskriti School say they feel safe about the school’s measures. “I am not worried. Life has to go on. 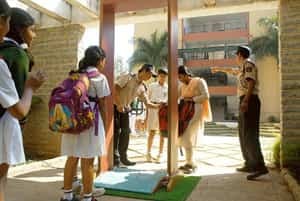 I am quite confident about the security," said Guneeta Duggal, who represents parents for one class in the Sanskriti School’s parent-teacher association, and has a son in the school. Taru Bahl contributed to this story.